It took in just £3.1 million in the US over its opening weekend and is on target to become Johnny Depp's worst performing movie ever. But it looks like co-star Amber Heard has taken it upon herself to save The Rum Diaries from being a a wash-out in the UK at least. The 25-year-old donned a stunning form-fitting gown for the Kensington premiere tonight. Johnny looked sharp by her side in a midnight blue suit with a gold chain and pinstriped shirt. He went all out to pay attention to the loyal fans who showed up, cooing at a baby next to the red carpet and kissing an elderly woman's hand. Also in attendance was Casino Royale star Eva Green, who set off her porcelain skin with a knee-length black dress and scarlet lipstick. Hollyoaks star Ali Bastian showed up in casual skinny black trousers and a matching jacket. Critics have slammed The Rum Diary, which cost £35million to make, giving it a C rating. 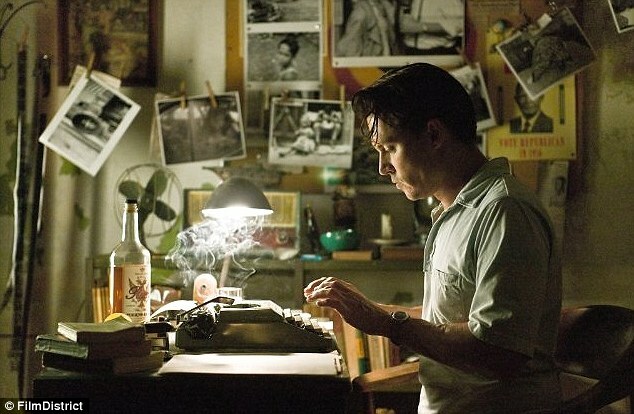 The Rum Diary is adapted from the book of the same name by the late author Hunter S Thompson, a friend of Depp. Directed by Bruce Robinson, it tells the story of American journalist Paul Kemp (Depp), who takes on a freelance job in Puerto Rico for a local newspaper during the 1950s. There, he struggles to find a balance between island culture and the ex-patriots who live there. He ends up becoming increasingly obsessed with Amber's character Chenault, the fiancée of shady businessman Sanderson (played by Aaron Eckhart). He first sees her when he stares through a telescope at the mogul’s mansion, and spots her hopping aboard Sanderson’s yacht in a skimpy bikini. In a scene that display’s the movie’s close-to-the-knuckle dialogue, he is caught in the act he explains, ‘I was looking at his boat. Kemp soon worms his way into Chenault’s affections, and after she tests him by persuading him to speed his car at over 100 mph towards a pier the pair share a passionate and raunchy love scene. There has been speculation that Depp's performance would echo his of drug-addled Hunter S Thompson avatar Raoul Duke in the 1998 ult classic Fear And Loathing In Las Vegas. Though the film shares some of the same mix of reality and drug-induced fantasy, Depp’s latest film appears a more focused effort than the willfully scatter-shot 1998 movie. Though the book on which it is based was first published in 1998, Thompson wrote the novel at age 22 in the early 1960s. It was inspired by his own experiences working as a young reporter at a newspaper in Puerto Rico. English Withnail and I filmmaker Bruce Robinson wrote the screenplay and directed the movie after taking more than a decade off from Hollywood.